Omar Robert Hamilton's debut novel is a beautifully crafted examination of the Egyptian revolution and its aftermath, writes Ahmed Masoud. 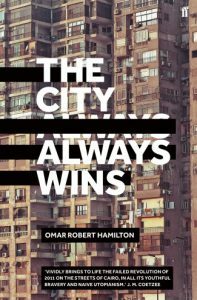 If I didn’t have to write this review, I would probably have never finished reading The City Always Wins, by the talented Omar Robert Hamilton. Instead, I would have carried the book with me everywhere, keeping it by my bedside and reading a passage or two at a time, leafing through the pages at random; as if putting my favourite music playlist on shuffle mode. There are very few books that have had such an impact upon me — Pascal Mercier’s Night Train to Lisbon comes closest, but Omar’s debut effort certainly wins that lyrical contest. The City Always Wins is a tale of the aftermath of the Egyptian revolution of January 25, 2011, and the ensuing quest for democracy, told through the lens of a group of revolutionaries driven by faith in a better future for their country. The book presents a fascinating insight into the green room of the revolution, and the challenges it faced. We all know how those events unfolded, or maybe we think we do. The dishonourable pact between the army and the Muslim Brotherhood against the revolution is a pivotal milestone in the story; yet it’s something many outsiders might have missed amidst the cacophony of media coverage. As a spectator of the events myself, I had little notion of that the Muslim Brotherhood — these ‘dictators in waiting’ — were leading Egypt into another period of darkness. Even though I disagreed with the MB’s politics, and their quest for ultimate power, I had failed to notice the extent to which they were derailing the revolution and, in so doing, paving the way for the army to take back control. Someone who did see all of this is Khalil, the prophetic, American-Egyptian central character of the book. In the delirious euphoria of the events of 30 June 2013 — General Sisi’s summer coup, and Morsi’s downfall — he saw what was going to happen next: ultimate powers back in the hands of the army. As part of their ‘Chaos Cairo Collective’, Miriam and Khalil are pioneering media reporting of the revolution, documenting protests as they happen and collecting testimonies from those tortured or imprisoned by the regime. Through the eyes of these observers — Miriam, Khalil, Hafez, Alaa, Rosa — readers are able to catch raw glimpses of the inner, chaotic life of the revolution. We watch as they cheer the fall of Mubarak; disagree over leaving Tahrir Square; are outraged at the Muslim Brotherhood’s ploys; urge people to protest against Morsi’s darkening reign. And then, all of a sudden, Murphy’s Law starts to unfold in front of their eyes. Within two years, the army has taken back control and they have become, once again, the hunted; chased, one after the other, like ‘wild dogs’. What if the revolutionaries had taken over the Maspero Television building? What if Khalil hadn’t run away from the police and, thus, ended up in prison? What if the martyr hadn’t gone to Tahrir Square on that fateful morning? What if the Muslim Brotherhood hadn’t acted so stupidly in conspiring with the army against the people? What if the Left’s energies hadn’t been so needlessly divided between two candidates at the presidential elections? Of course, ‘What if’ continues to exert its spell on all of us observers of the ongoing events of the ‘Arab Spring’. What if the revolution in Egypt had succeeded in extending the democratic tide across the wider Middle East? What if the Syrian conflict hadn’t turned into the bloody and devastating catastrophe it is now? What if all those Western-made dictators had vanished? For that matter, what if the so-called ‘Arab Spring’ had never happened in the first place? These questions are yet to be answered. In the case of Egypt, our collective imaginations seem barely able to come to terms with the realities of the new military order; many of which are described with lucid starkness throughout The City Always Wins: The never-ending cycle of arrests, the massacre of the Muslim Brotherhood protesters in the summer of 2013, the arrest of Alaa and Rosa, and many others from the ‘Chaos Cairo’ Collective. And this, strangely enough, is the trouble with Hamilton’s novel. Put plainly, it seems to present the Egyptian revolution — or the various strands within it — with a relentless romanticism I’m not sure really works in its context. Moving along the well-crafted lyrical passages and monologues of the book, I couldn’t help but picture myself in some theatre, watching a musical production of Les Miserables (perhaps because Hugo’s original opus, was itself about another, much-celebrated revolution), and soon belting out “There’s a grief that can’t be spoken, there’s a pain goes on and on; empty chairs at empty tables now my friends are dead and gone.” When Khalil goes into the Stella Bar — after the army had taken over, and images of Sisi filled the streets outside — I half-saw the lines, “Here they talked of revolution, here it was they lit the flame, here they sang about tomorrow and tomorrow never came” appear on the pages. The Revolutionaries in The City Always Wins are unabashedly idealised — another Les Mis echo — as is their quest for a better future for their country. Khalil goes into endless soliloquies about the emptiness and savagery of the world around him, yet never seems to delve that deeply into a discussion or debate of the central questions, such as why the Egyptian Left had been so fatally divided. Yes, mistakes were made, the novel seems to concede through its portrayal of the revolutionaries’ decision to support two Left candidates — which ceded the terrain to the Army and Muslim Brotherhood — but the book doesn’t really address or invoke other unification attempts by the Left. Had the elections not taken place so soon after Mubarak’s downfall, could there have been a different outcome? One in which, perhaps, the Brotherhood never got in in the first place? The novel’s overarching thesis, namely that the conflict between the army and the Brotherhood is the reason why the revolution failed, perhaps explains its romanticisation of the Revolutionaries. Such idolising of Khalil, Miriam and their fellow comrades, however, might strike some readers as a little too credulous. On a personal note, as a Palestinian and a member of the Palestinian literary revolution, I believe it is crucial for us on the Left to discuss, as openly as possible, the key issues that divide us before attempting to take on the ‘other side’ and their shoddy deals and conspiracies. It’s a powerful scene, and offers a striking reflection: that Cairo will always rebel against its tyrants; that there will always be someone, out there, protesting; that there will always be a revolution around every corner. 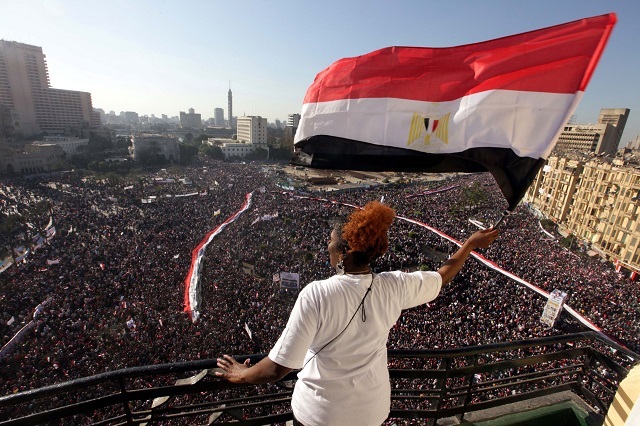 That what happened in Tahrir will continue to propel the city’s revolutionary spirits for a long time to come. Omar’s novel also brilliantly presents the issue of women’s harassment for what it really is, an endemic problem. His decision to highlight anti-harassment vigilantes operating during the protests in Tahrir offers an honest account of an uncomfortable facet of the Tahrir story. The revelation that the Muslim Brotherhood, once in power, adopted and deployed the Mubarak regime’s harassment techniques against women to deter them from protesting is a startling one. This is an especially important issue to highlight because it remains very much part of Egyptian women’s lived realities; only a few months ago, Cairo was named as the worst city in the world for women to live in. In this light, Hamilton’s foregrounding of strong female characters is admirable, and offers readers a portrait of the revolution’s many strong, empowered Egyptian women — women who have remained largely unheralded since, and who continue to struggle against a deeply misogynistic society. I have no doubt that I will be reading The City Always Wins over and over again for years to come, soaking more of those beautifully written pages and admiring a tale of a city that is rebelling every day — a city where events can go from success to failure in a single moment — and, whenever things in the city change, as they are bound to, I will revisit the book in search of those prophecies I had missed the first time round. Ahmed Masoud is the author of the debut novel Vanished - The Mysterious Disappearance of Mustafa Ouda. Ahmed is a writer and director who grew up in Palestine and moved to the UK in 2002. His theatre credits include Camouflage (London 2017) The Shroud Maker (London 2015), Walaa, Loyalty (London 2014, funded by Arts Council England), Go to Gaza, Drink the Sea (London and Edinburgh 2009) and Escape from Gaza (BBC Radio 4, 2011) Ahmed is the founder of Al Zaytouna Dance Theatre (2005) where he wrote and directed several productions in London, with subsequent European Tours. After finishing his PhD research, Ahmed published many journals and articles including a chapter in Britain and the Muslim World: A historical Perspective (Cambridge Scholars Publishing, 2011). An earlier version of Vanished won the Muslim Writers Awards (London 2011 supported by Penguin Books). For more information, please visit www.ahmedmasoud.co.uk.